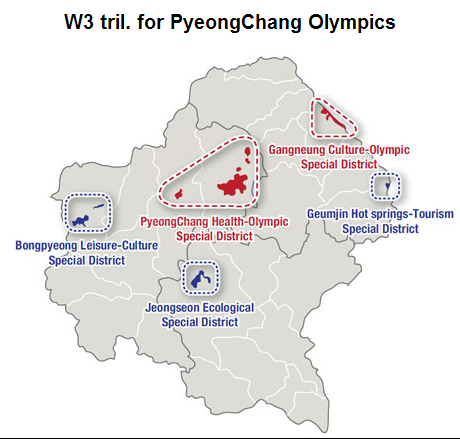 As the world gets ready to focus its attention on next month's Winter Olympics in Sochi, local media have given some attention to the next Winter Games, to be held in Pyeongchang in 2018. Specifically, the local press are discussing the pros and cons of the government's announcement that it will invest about $2.8 billion over the next five years in Gangwon Province to prepare for the 2018 games. The accompanying graphic (click to see a large version), published in The Korea Times, shows the zones where much of that investment is concentrated. Although the expenditure of $3 billion and questions about use of Winter Olympic facilities in the years following the Games are certainly important, they should be kept in perspective. In this day and age, the Olympic Games, both Winter and Summer are primarily a global media event. The reach of the Olympics, the experience of the Games and the manner in which they are financed, all depend heavily upon television and the media. That means, of course, that the broadband and mobile communication revolutions are a major part of the current transformation in the Olympic experience. We saw glimpses of this in the London Olympics, and Sochi is being billed as the first "bring your own device" Olympics. In this regard, it is important to remember that Samsung Electronics is one of the Olympic TOP sponsors and the official mobile communication provider for the Olympic games. According to Reuters, Samsung Electronics spent more than $14 billion, more than Iceland's GDP on marketing and advertising in 2013. As reported in the Korea IT Times, Samsung's Wireless Olympic Works (WOW) app has just been released and "As part of the “Samsung Smart Olympic Games Initiative”, Samsung will provide around 18,000 mobile devices to the Olympic Family, including executives, staff, and officials from the IOC, National Olympic Committees and organizing committees in Sochi.They will be connected to Samsung’s WOW service which will provide essential, up-to-date Games Time data and connectivity that is crucial to the Olympic Winter Games operation." According to Forbes, Samsung will provide each athlete at the Sochi Games with a Galaxy Note 3. The magazine notes the global promotional impact of 2,500 athletes using those devices to record and send video during the opening and closing ceremonies of the Games.